The premier Pujols rookie to own in high grade. Easily among a short list of all-around great figures in the game of baseball, Pujols' popularity only continues to rise as his career meets new milestones. Offered here is among the single finest example we've brokered in our 15 year tenure with flawless edges. 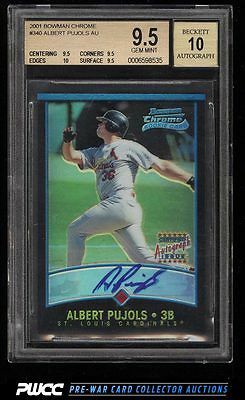 Comes with an impressive BGS 10 auto grade to boot! One of nearly 20,000 cards, lots, and sets up for bid in our 7th Auction of 2016. Click on the link above to view the other PWCC auction lots.